Enjoy convenient access to Koh Samui's unspoiled natural beauty. Our hotel can help you arrange hiking, mountain biking, kayaking, and more. You won’t get closer to paradise than at our Renaissance Koh Samui Resort & Spa. With accommodations that include everything from seaside villas with butler service to deluxe rooms with their own private whirlpools, beach vacations don’t get much better than this. Our stunning location is ideal for a romantic getaway or a truly unforgettable destination wedding. Our spa resort will make you feel a million miles away from the real world. 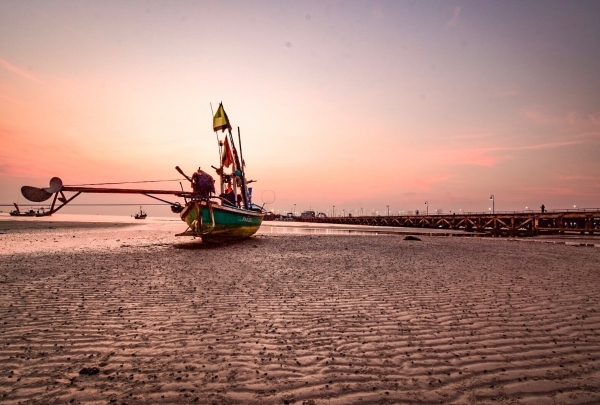 If you can drag yourself away from the beach — and we wouldn’t blame you if you didn’t — discover the stunning scenery of Lamai and its colorful markets. Our Navigator Budsarin will be thrilled to fill you in on all the best local sights and sounds. Dine with your toes in the sand. Enjoy dinner and drinks on the beach at Think & Retro. This hip spot has great food and a great ideology: they try to reduce waste on the island by recycling and promoting sustainable practices. 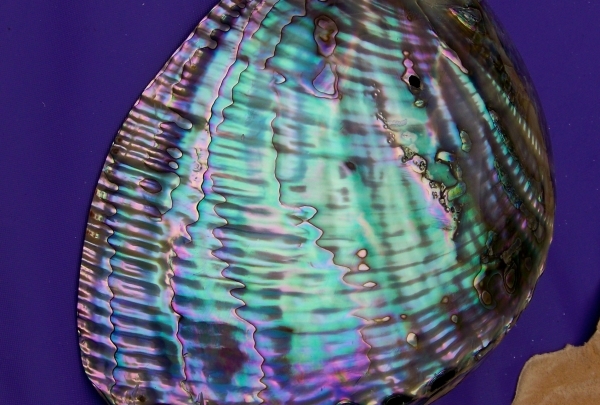 Find gifts made out of coconut shells and wood. You can't come to the Coconut Island without purchasing something made from coconut shells. 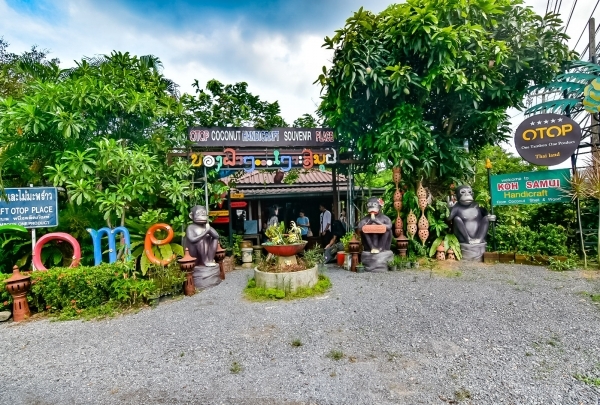 At Koh Samui Handicraft, you will find a variety of pretty gifts and accessories made out of natural products found on the island, including coconut shells. A hidden gem of Koh Samui, be sure to visit the traditional temple of Lamai made out of red clay. 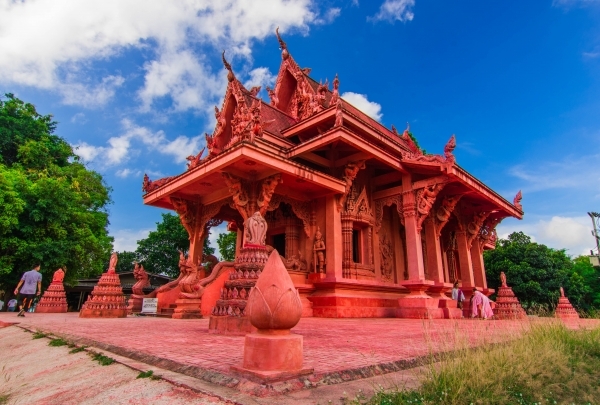 This red clay temple is located in a tranquil spot overlooking Lamai Bay in the largest Muslim city on Koh Samui. Looking for organic meals near you? 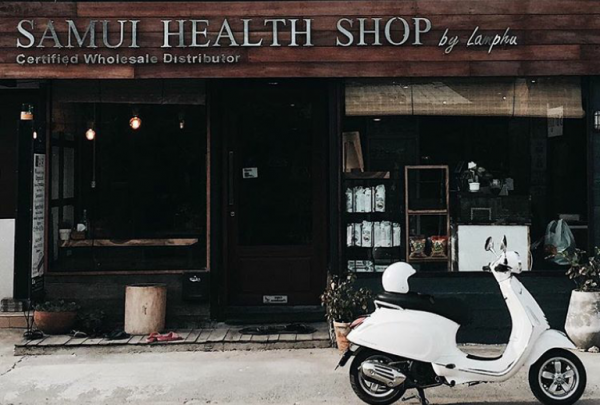 Samui Health Shop by Lamphu is the answer. 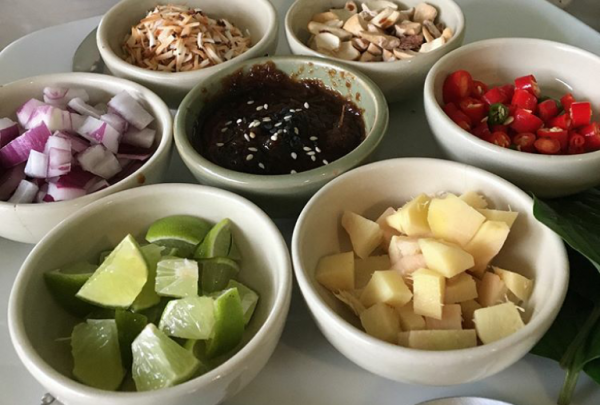 This health shop in Lamai offers organic, natural, and vegetarian options for the health conscious diner. It is a farm-to-table shop, meaning the delicious meals are not only good for your body but also good for the environment. Enjoy local spices and tropical fruits away from tourist crowds. 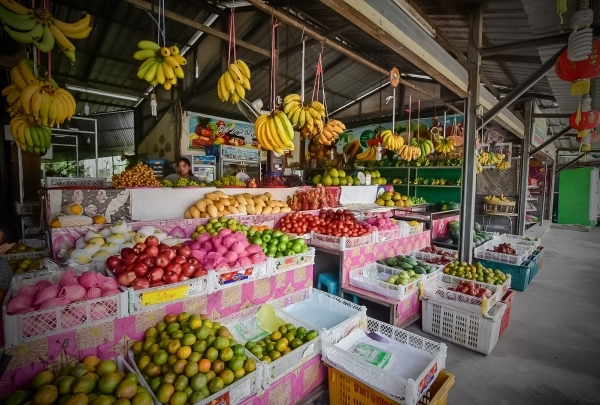 Srifa Fresh Market is a daily market where visitors can buy fruits, vegetables, spices and a variety of dishes prepared by local vendors. If you are looking for traditional wear, then the Thai Fisherman Pants shop is a place you should explore. This cozy, small shop on the Lamai Beach is most popular for selling a traditional garment that the Thai fishermen wear. Flexible movement and easy drying are traits of this garment that's sold with a modern twist at this shop. Escape from all touristic crowd to The Road Less Travelled Samui , on west side of Samui island. Hand-made chocolates at RLT are already gaining a fabulous reputation on our gorgeous island of Samui. The RLT have created a proper Thai bar snack that goes beautifully with any beer. 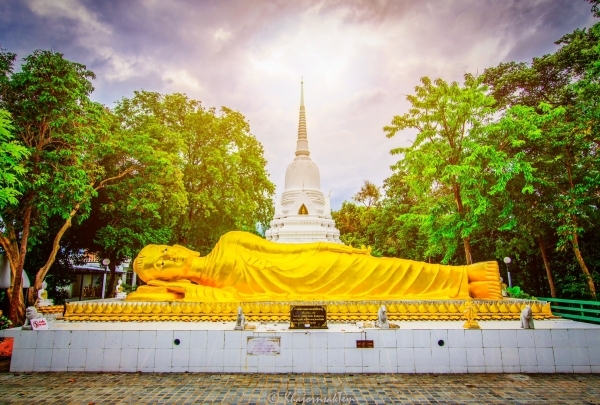 Experience history and breathtaking views at Wat Khao Chedi after a refreshing hike up the green Thai hillside. Wat Khao Chedi is a traditional Thai pagoda located on a lush, green hillside. A short hike leads up to the sparkling gold temple that glitters in the sun and breathtaking views of the surrounding land and sea. Visitors enjoy exploring the pagoda and viewing surrounding villages from the elevated vantage point. 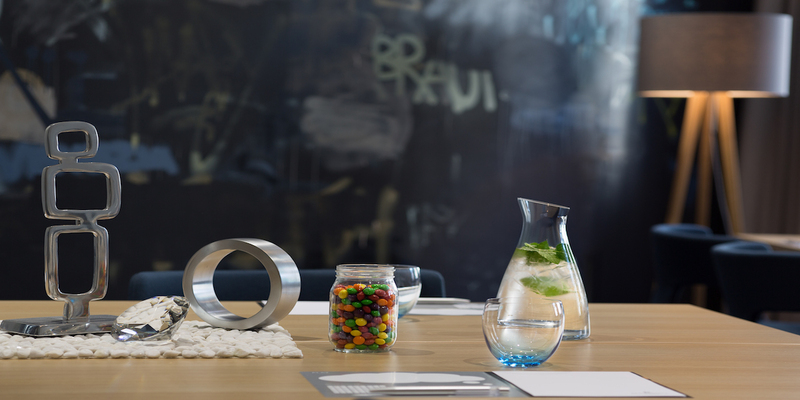 Grab a drink at this chic café. 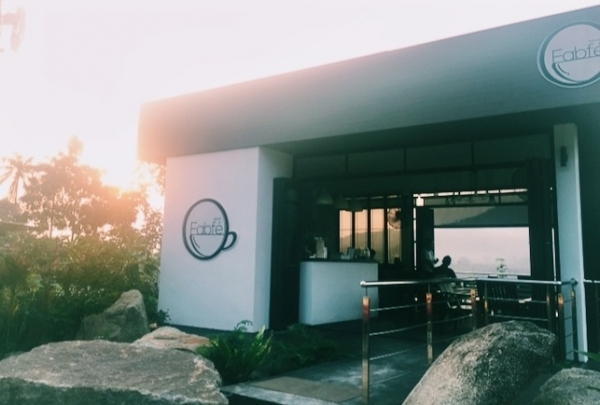 Dreamy and breathtaking Fabfé Café invites you to sample the pleasures of life. Patrons can sip their drink of choice while gazing out at beautiful Koh Samui's hills and paddy fields. Take in the sunset while savoring some delectable sweets. 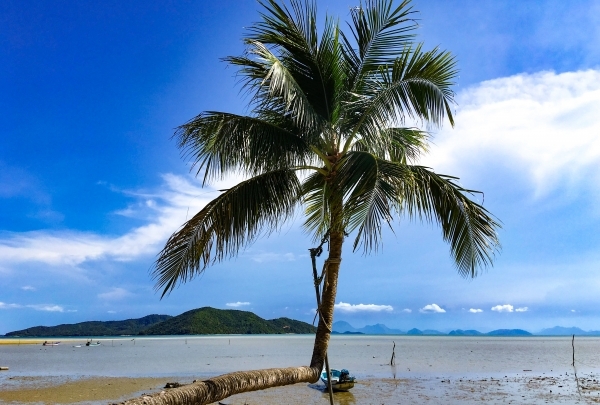 Discover Samui coconut farming and the Thong Krut beach walk. One of the largest coconut farms in Samui is located in the Thong Krut area. Witness the local coconut harvesting methods while sampling some of the local produce. You can also pick up virgin coconut oil from a local shop on Thong Krut beach. 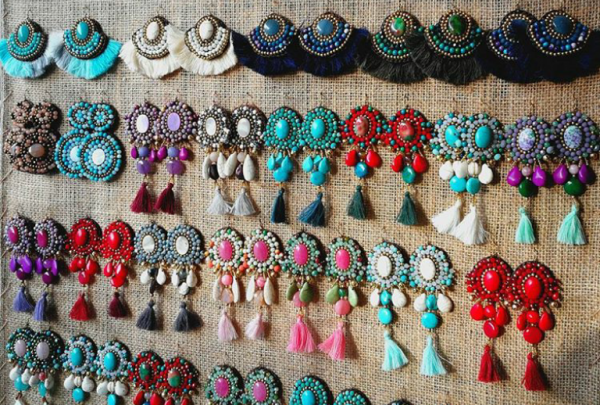 Shop the handmade jewelry at Bowtiful for nature-inspired pieces in a beachfront boutique. Bowtiful's small shop in Lamai Beach boasts an impressive collection of handmade jewelry. Most of the pieces in the shop are crafted with stone, shells, and wood to create an organic aesthetic, but there are also pieces made of silver and semi-precious stones. Bowtiful also offers handbags and watches in addition to bracelets, rings, and necklaces. Come enjoy a variety of delicious Thai dishes including wraps, curries, and a selection of vegetarian options. 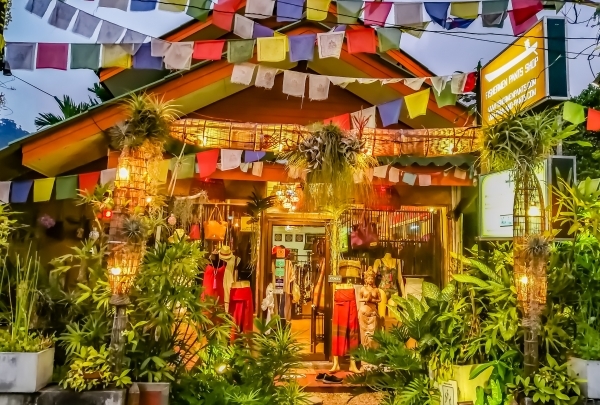 If you're looking for a healthy meal in Koh Samui, head to Sweet Sisters Cafe. 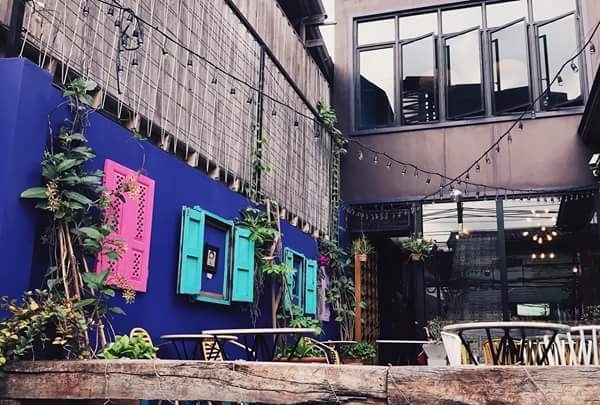 This eatery uses the finest, freshest produce from local suppliers to create a delectable menu of wraps and curries that features options for vegetarians and those with gluten sensitivities. Enjoy pesto salad with feta cheese, red curry, and freshly baked brownies for dessert. Dishes and drinks at this casual eatery are often topped with a fresh flower, for an extra special touch. A 3-kilometer trek through winding jungle paths and carpets of spring flowers will lead you to this lush oasis by a thundering waterfall. 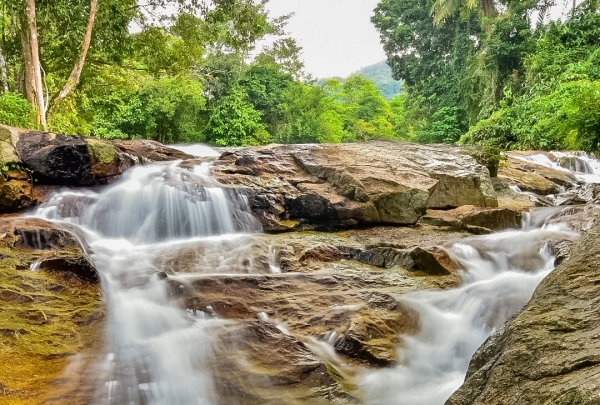 The Hin Lad Waterfall is one of Koh Samui's best known attractions, and a must-visit for nature and outdoor enthusiasts. An invigorating trek through the beautiful forests will lead you to the falls, where you can swim, picnic or simply relax. The Hin Lad monastery is a tranquil haven and popular pilgrimage site; the beautiful gardens filled with Buddha sculptures and the meditation area are worth a visit. Monsoon is the best time to hike up to the falls, as the waterfall is at its most majestic. Watch the magnificent sunset over the Gulf of Thailand as you sip on fruity tropical drinks at this retro-themed beach front cafe and bar. Right on Bang Po beach, 4 Monkeys Coffee Bar couldn't be better placed. The cafe's bamboo interiors are eclectically decorated with vintage royal portraits, bright furniture, local artifacts and drawings. Come here for healthy breakfasts, artisan coffee creations or laid-back drinks on their coconut-shaded deck. Bring a book and spend the afternoon reading while sipping on a perfectly-made latte against the glittering backdrop of the ocean. Towards evening the cafe morphs into a happening bar with loud music and free-flowing drinks. Browse the wind-swept racks at sunny Saona for boutique fashions with a tropical twist! Fisherman's Village has become Koh Samui's destination for high-end boutiques and shopping. Saona offers respected women's fashions, from dresses to purses. The boutique shop also features a number of stylish bathing suits, displayed beneath a tropical palm-frond canopy. Saona can easily dress a woman from head to toe, with straw hats, daywear, floral bags and fashionable sandals. 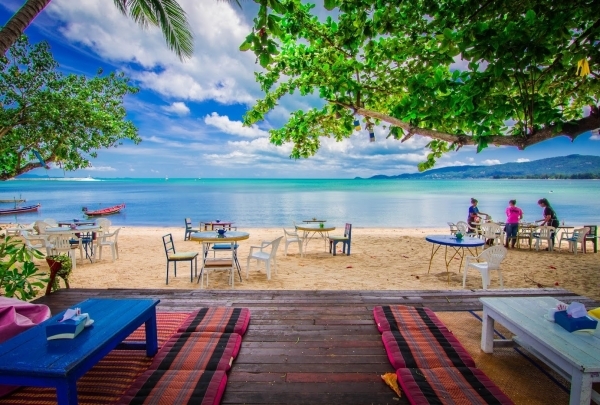 Enjoy the local side of Koh Samui. Samui's capital on the west cost, Nathon Town is a charming area. Discover local favorite hot spots for dining, shopping and sight seeing. The Giant Summit offers a panoramic island view of southern Koh Samui and its surrounding islands. 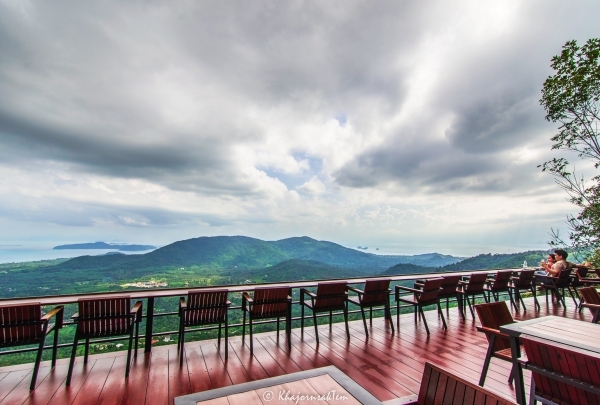 Boasting breathtaking vistas, The Giant Summit is undoubtedly one of Koh Samui's most romantic locales. 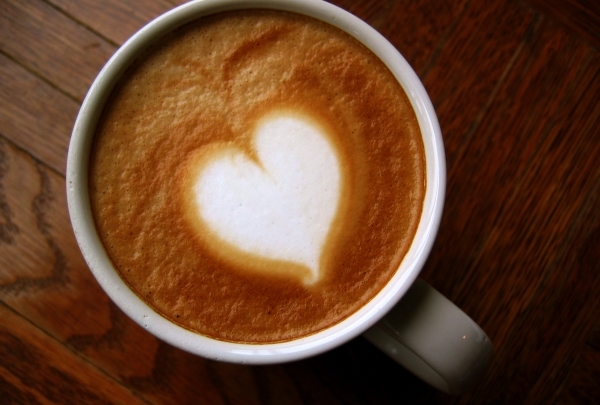 Stop by with your significant other or enjoy a drink on the scenic terrace. You can't go wrong at The Giant Summit.